If you are lucky enough to have a warm home to go to this Thanksgiving, filled with the mouthwatering smell of roasting turkey and the happy chatter of family and friends, then you have plenty of reasons to be thankful. It’s easy to get swept up in the hubbub of cooking and decorating, not to mention family tensions, and lose sight of what’s most important on this uniquely American holiday. Every family has their own Thanksgiving traditions, such as helping out at a food shelf or participating in a fun activity like an annual touch football game, but when everyone finally settles around the table we all share one thing: our thanks. Some families appoint one person to say grace, others join hands in a prayer or a song. Still other families go around the table and ask each person to share something they’re thankful for. Having been put on the spot a few times, some of us at Pear Tree thought it would be a nice idea to create note cards especially for this purpose. Several of our little mini note cards have been (or can be) personalized to ask the question “What are you thankful for?” with a blank area beneath the message or inside the card to write your answer. You can also use simple thank you cards for this purpose. We love Thanksgiving traditions like these, for lots of reasons. First it’s a meaningful activity for both kids and adults. The notes can be filled out in advance and read aloud, or passed around the table. You can even make a game out of guessing who wrote each one. Best of all, they can be kept! Send each guest home with their note as a remembrance, or give them to the hostess or the eldest member of the family. Thanksgiving is a time to count our blessings, and these little notes are a tangible reminder that we have a lot to be thankful for. It may even replace your old Thanksgiving traditions. 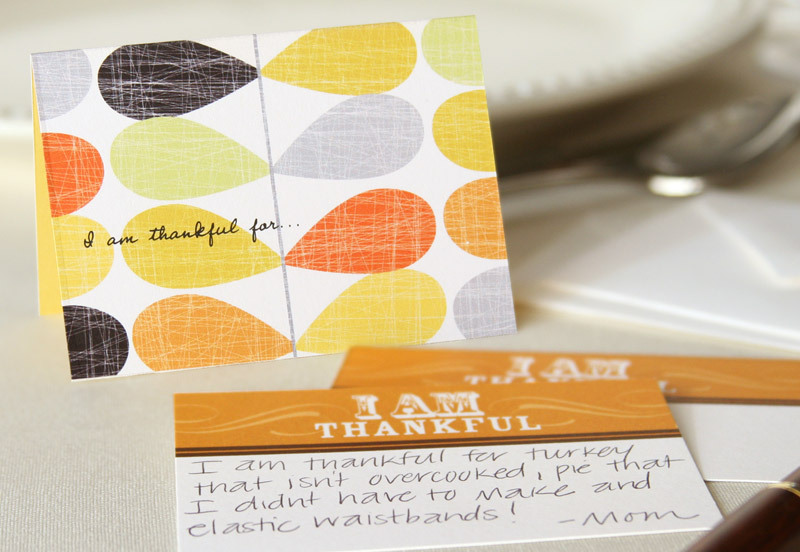 Shop our Thanksgiving mini note cards and Thanksgiving invitations to coordinate the look for your Thanksgiving celebration. Or for more Thanksgiving ideas, keep reading our blog. How about turkey feather shaped note to fill in around a family turkey like the primary school creations? The turkey could grow yearly and be displayed showing the changes over time. Great layers of varying patterns on each feather around the message.